Everyone loves the Echo Dot, and that’s not exactly surprising because what’s not to love? It’s the most affordable smart speaker from Amazon, giving you low-cost access to Alexa in any room of your house. Of course, all that money you’re saving by getting Echo Dots can be put to good use by clearing off your desks and tables, and making your Echo Dot installations more permanent. 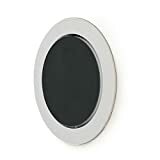 The Mount Genie Flush Mount might just be the best thing that has ever happened to the Echo Dot, allowing you to mount your Echo Dot in a wall or even ceiling in the cleanest way possible. It looks fantastic and it’s flush with the surface you mount it on. Trust us, it’ll be your new favorite Echo Dot accessory. International shipping to 99 countries available – simply add your international address at checkout. Held in place with precise pressure fit and wire placement. The mount comes in bright white like most switch plates but can be easily painted if desired. Patent Pending “Sound Channel” provides un-muffled, crisp sound from built-in speaker withouth any echo.